When the run to the US Presidential election started, many assumed that the nation would see a Bush vs Clinton contest in 2016. Many months ago, before all of the campaigns and primaries and debates, Jeb Bush was the clear favorite to win the Republican nomination. Jeb, it was thought, was moderate enough to stand a chance against former Secretary of State Hillary Clinton in the general election, which is why many GOP supporters thought he would get the nod for the nomination. That was, of course, until Hurricane Trump swept in and completely destroyed Jeb Bush's campaign. Donald Trump attacked Jeb Bush early and often, stating that the former Florida Governor was ineffectual, weak and "low energy". Despite the constant attacks, Jeb could never effectively fight back, despite his best efforts. In the end, Bush was simply not cut out for a nasty back-and-forth between himself and Trump and it eventually cost him the race. The general consensus was that Bush was outmaneuvered at every bend by Donald Trump. Jeb Bush pushed all of his chips into the middle of the table in South Carolina. The Bush family has done extremely well in the state in the past, with both George H.W. Bush and George W. Bush winning in South Carolina during their successful Presidential bids. Bush, desperate for some positive momentum, enlisted the help of his brother and his mother in South Carolina, though the efforts fell flat and the Presidential hopeful finished far behind Donald Trump and the likes of Marco Rubio and Ted Cruz. Unable to seize any momentum in South Carolina, Bush and his team decided to pull the plug a short time later. 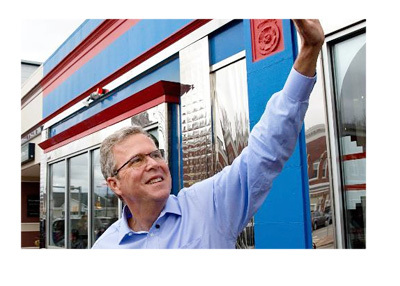 Somewhere along the way, Jeb Bush was deserted by the majority of his supporters. Some chose Donald Trump and his maverick approach, while others sided with Marco Rubio. Bush saw his support dwindle into the single digits despite starting his Presidential run with so much promise many months ago. In the end, Donald Trump crushed Jeb Bush, just as he had promised to do all along.